Both of these terms are associated with hearing loss that deteriorates gradually over time but are differentiated in definition, though they are often described together.Both conditions usually affect both ears equally. Presbycusis is very common and occurs to almost half of those over 70 years of age, hence is defined as age-related hearing loss. Most sufferers of presbycusis lose the ability to hear high-pitched sounds but are able to still hear lower tones. This term is given to those whom lose hearing ability due to continued exposure to noise levels that are not related to their occupation. These sounds can be detrimental to hearing ability if they are constant, even if in the background, or of a continually loud volume. Causes Of Presbycusis And Sociocusis. There are many causes of age related hearing loss and sociocusis, with reasons including: continued exposure to constant noise from music, television, domestic appliances and traffic.The ageing process also causes many illnesses that can affect the function of the middle and inner ear. Diseases such as diabetes, circulatory problems and cardiovascular illnesses can all alter the function of the delicate structures of the ear as blood flow can become significantly affected. Some medications given for these and other illness can also cause disturbances in the normal function of these components of the ear. 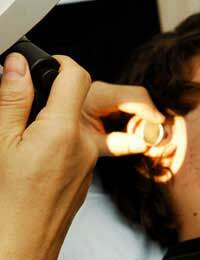 In some sufferers, hearing loss is due to changes in the nerve pathway transmissions or because of a reduction in hair cells of the middle ear; both are age related.In some instances there may be an abnormality in the bony structures of the ear anatomy, or damage to the eardrum, causing this hearing loss.Some ear health specialists believe that genetics has a certain role to play and if previous generations suffered from hearing loss as they grew older, this significantly increases the chances of their descendents suffering from it also. As both conditions deteriorate gradually over a long period of time, the person with the condition will often be unaware that they are suffering from some degree of hearing loss until those around them mention it.With both conditions there is often a loss of high frequency sounds, including those used is speech, so often full conversations are misheard or occasionally not understood at all. Many of those with presbycusis agree that background noise can add to their difficulty in hearing and will often need to turn off the television or radio when visitors arrive.As conversations can sometimes be misheard, or because of the need for a reduction in background noise, many people with these conditions withdraw from society as they can begin to feel quite isolated and lonely. Many specialists will suggest the use of a hearing device that either amplifies sounds or adds clarity to sound, both of which should be fitted properly and recommended by a properly trained professional. Many people find they benefit from learning how to read visual clues such as lip movements or by simply ensuring they are stood face to face to the person talking to them. Sometimes the GP can make changes to the existing medications in order to try and reduce the side effects of the current medications that may be contributing to the hearing loss.If other conditions are suspected such as diabetes, these must be properly diagnosed and treated in order for a hearing specialist to recommend the most appropriate and beneficial treatment. Presbycusis and sociocusis are terms given to gradual hearing loss over time but have slightly differing definitions. They occur to many of those in the later stages of .life and can be the reason for social isolation and depression.Sufferers of either of these conditions may benefit from the input of a trained ear health professional in order to seek advice and treatment options.